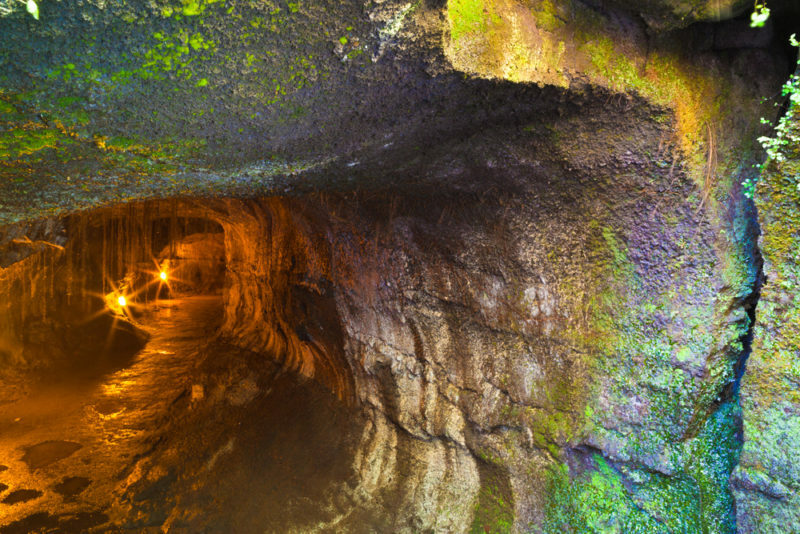 Kaumana Caves is a must if you’re headed off to the Big Island and are eager to explore a maze of lava tubes created on Hawaii’s youngest island. There is A LOT to see in these tubes and caverns. Please be warned, this isn’t a lighted trail with guides, signs and walkways. Nope. Instead, you should be expecting dripping cave water, roots growing everywhere, some hard work and of course, complete darkness (so bring those headlamps!). The best part about Kaumana Caves is that it’s free and open to the public! 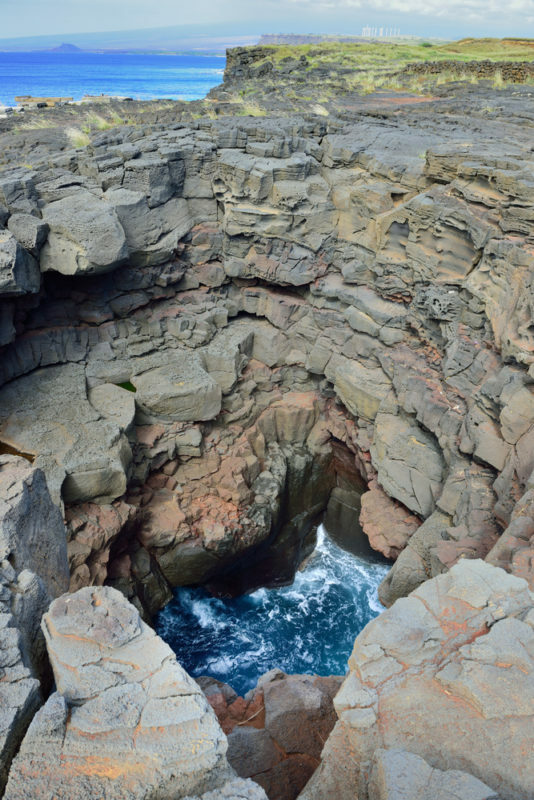 But, if going in unguided into Kaumana Caves is not your thing, no worries – there are plenty of guided tours into complex lava tubes and caverns all over the Big Island and I’ll cover them here. Kaumana Caves is an experience for those who want to explore on their own. But if you want an in-depth tour without fully tiring yourself out, check out this Big Island Epic Journey Tour. Because the Kaumana caves aren’t a paid tour, they aren’t really marketed to the public, which is great for those of us who do our research! There’s usually only a handful of people here but don’t be surprised if you don’t see anyone else. However, there is safety in numbers so make sure somebody knows where you are before you head out. And it’s always a good idea to come to Kaumana caves with somebody else just in case of an emergency. MOST people who come out of Kaumana caves love the experience. And why wouldn’t they? 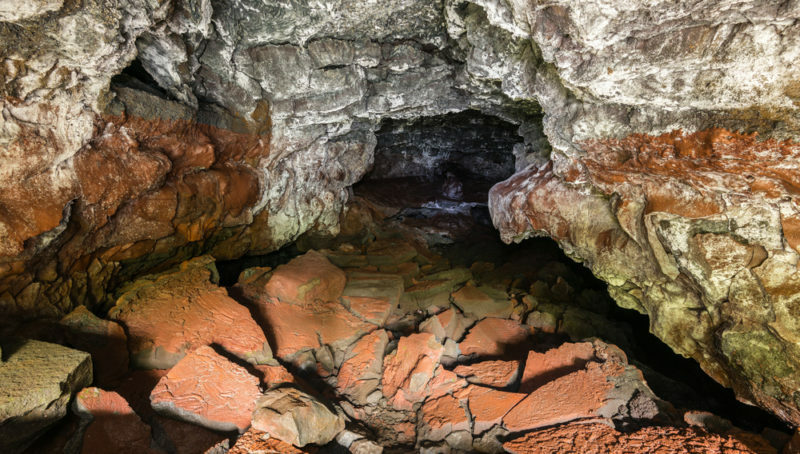 The Kaumana caves offer fewer tourists, no crowd and a more “real” experience than other lava tubes on the Big Island. However, that also means that there are no safety lights, the ground is very uneven, water will be dripping on you from above and there is no designated trail. In fact, you’ll see slippery moss growing on the rocks down here. Kaumana caves is for those who are adventurous, do not mind slipping, take precaution to come prepared and are not afraid of the dark or claustrophobic. It is not for those who’d rather have a “cleaner” lava tube experience. What to bring to Kaumana Caves? Good, sturdy shoes for stepping on rocks, slippery moss and rubble. Long pants. Depending on which path you choose, you may have to crawl. Plus, it’s just safer since you’re literally walking in the dark. A strong headlamp and/or flashlight that won’t fail you. Your smartphone light won’t be enough to get you through Kaumana caves. Each person needs to have their own light. Water. If you really plan on spending the time to explore the entirety of the Kaumana caves, then water and maybe a snack or two would be best. What to expect in Kaumana Caves? Water dripping down from the ceiling and water on the ground. If you’re exploring every inch of Kaumana caves, expect your shoes and pants to get wet. You don’t have to explore the whole thing. If you come across a puddle or a potential workout that you’d rather avoid, turn around and try a different direction. You’ll still have a blast exploring everything else. Some parts of the Kaumana caves require that you get down on your hands and knees. Long pants are great here. Slippery rocks. The constant dripping water and mossy rocks make for some unstable pathways. Be careful with each step. Older kids often love Kaumana caves. If you’re coming to the Big Island with children in tow, this lava tube may be something for you to consider. Theft does occur sometimes in the Kaumana caves parking lot. Take your valuables with you. Rainy days are an excellent time to explore the Kaumana caves since you’ll get wet anyway. But avoid rainstorms since there is potential for flash flooding. Accessible only by a tour because it’s on private property in a gated community, but so worth it! The guides are amazing with an incredible amount of knowledge. What’s makes the Kula Kai caverns stand apart from the Kaumana caves is how in depth the guides get into explaining the history and science behind the lava tubes. Check out the Kula Kai caverns site to book your reservation. If you’re interested in more than just the Kula Kai caverns, the Big Island Epic journey tour will take you to explore various sights of the island including the Kula Kai caverns. You’ll sightsee farms, Punaluu beach, the Hawaii Volcanoes National Park and even have a private viewing of the famed Rainbow Falls! Local tip: Bring your own flashlight (one will still be provided to you) so that you can examine things closely at your own pace as you follow the tour guide. Kazumura Cave Tours does an exceptional job in their guided tours because you’ll be learning from someone who genuinely loves lava tubes! Plus, it’s pretty awesome if you can say that you’ve been to the world’s longest lava tube. Considering the price and what you’ll see on this guided tour, I believe you’ll get the most bang for your buck here. And if you’re highly interested in lava tubes, Harry Shick has dedicated many years to studying lava tubes and is now leading tours at Kazumura Cave. You can read about his research and observation in his book pictured below. Thurston’s lava tube is better for those who don’t want to exert a lot of effort and are looking for a nice stroll (there are still ups and downs, but it’s certainly walkable). There aren’t many opportunities to learn about what you’re looking at and walking through can get quite crowded. Thurston’s lava tube will give you a good idea of the power and the heat of the lava that literally burnt a hole through the ground. Local Tip: If you’re really into the science behind the tube, I’d highly suggest looking into a lava tube tour. You’ll learn a lot more and see much more detail. Thurston, Nahuku and now Puapoo? How do you tell the difference? Thurston and Nahuku are one and the same. Nahuku is just the Hawaiian name for the Thurston lava tube. Puapoo, however, is the name for the separate tour (with tour guide) for Thurston’s lava tube. Space is very limited so if you’re interested in this lava tour, I’d sign up for the reservation for as soon as possible. 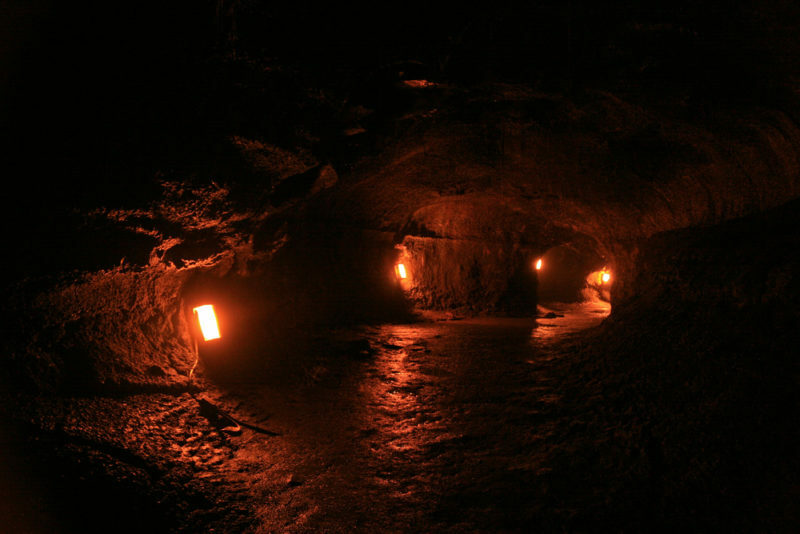 Now if the Thurston lava tube is too touristy for you, the Kaumana caves are too much work, and the paid tours are too much money…don’t worry! I still have another lava tube suggestion for you! Head to Ka Lae (South Point), which is famous for many reasons. First, it’s the most southern point in the United States. Kind of like that straddling the state line feeling. Secondly, it’s known as a popular cliff jumping spot among tourists and locals. There are even a couple of ladders that will help get you out of the water. But what I find really neat here is the huge lava tube just a few steps inland from where the cliff jumping actions takes place. The hole/tunnel is huge and it’s hard to imagine that at some point that much lava flowed through and spilled into the ocean! It’s a pretty amazing sight. Interested in cliff jumping at Ka Lae? Check out Tegan and Daniel’s experience there as they spent the day jumping, swimming and snorkeling.